The land seems fresh as if it was just revealed to the light, just waiting to be witnessed. I’ve only been to Alaska couple of times, but even in the short amount of time that I have spent there, I’m able to recognize that it is a special and wondrous place. All wilderness and wild places are sacred but there is something different about Alaska, I maybe bias but I really believe that. 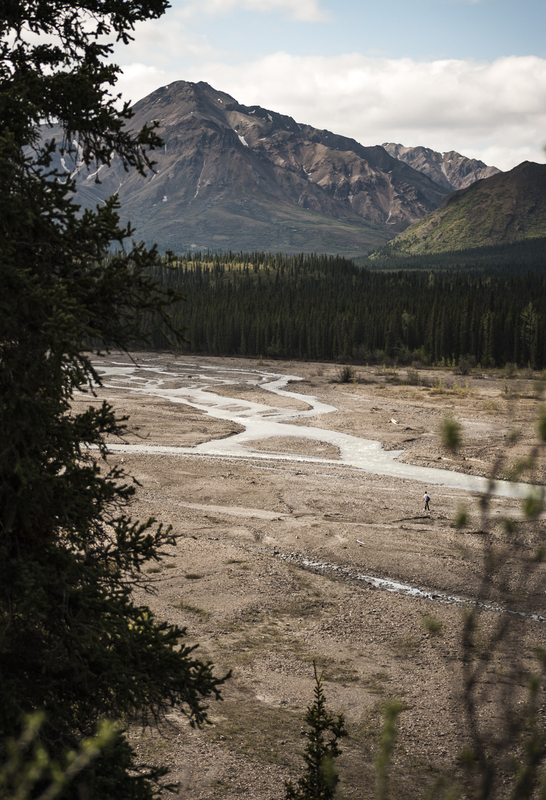 On the 85 mile park road in Denali, there are several turnouts and rest stops for the visitors to take advantage of. One rest stop in particular stands out to me. Coming up to the stop I hadn’t thought much about it other then being able to get off the bis and walk around. But after being off the bus for a bit I had noticed that the guy that had been sitting behind on the bus was now walking down the river wash. Knowing that its not a big deal for people to decide to get of the buses and go for hikes I at first didn’t think much of it. But knowing that he didn’t really have much for gear or protective clothing I did start to wonder what he was doing. I had noticed while on the bus he had a small shoulder bag made from yarn, one like your grandma would make for you, with a few odd and ends in it, along with not having a jacket. But when I saw him walking down the rive wash I thought to myself, “another McCandless?” I hurried out to a spot for this shot before we had to board and leave. The immensity of the landscape. It has an ability to swallow you whole and to leave no trace of your former self. That is what I think of when Alaska and her wilderness come to mind. 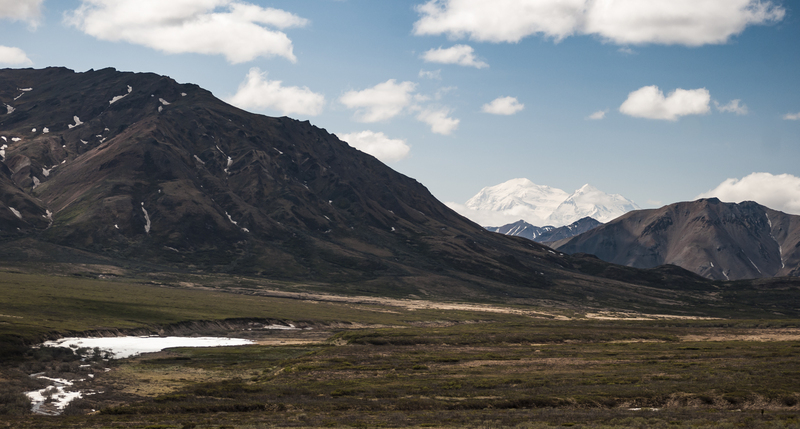 Denali is sometimes referred to as an 20% mountain, since its only visible 20% of the time, the rest of the time its usually shrouded in clouds. 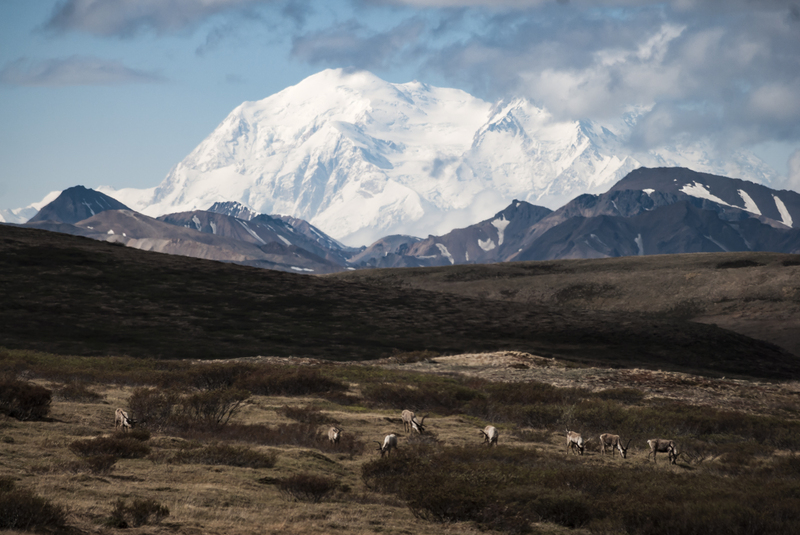 Thats why I was so excited to get this of the not only Denali but of caribou as well, in the same frame no doubt. After getting what I could of this seen, I began to review them on the screen on the back of my camera like a chimp. While scrolling through them I began to wish I could have gotten closer and a bit of a different angle. None the less I am relatively happen with this shot, mainly due to the subject matter. ← It snowed in Tulsa.